Mesa Arch in Canyonlands National Park welcomes the sunrise through it's grand sandstone arch. Looking east towards Utah's La Sal Mountains, the sun breaks the ridgeline causing Mesa Arch to glow a vibrant red. This moment is short lived and Mesa Arch appears to be on fire for only a brief time. 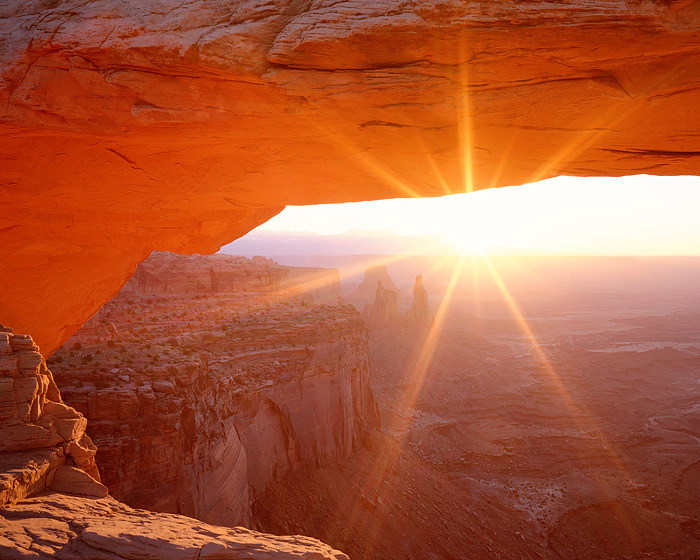 The Sun continues to rise over Utah and it's famous Canyonlands. As the Sun continues to rise over the Colorado Plateau, the sandstone will go from a fire red, to a more subdued chocholate brown veneer. Photo © copyright by Thomas Mangan.